Bridget O’Bannon Masterson’s marriage was the beginning of her three-year estrangement from her mother and sisters, but when Bridget’s husband, Jim, is struck by a drunk driver as he steps from a taxi, her mother and two of her sisters are there to help Bridget through the shock and grief and to insist she resume her life when Bridget wants to “crawl into bed and shut the blinds and drink until [she] forget[s] what day it is.” Bridget had just begun to realize how short the reality of her marriage fell from the marriage she wanted when Jim was killed. Now in the weeks and months after his death, she begins to discover the secrets he harbored, including a lapsed life insurance policy and an overdrawn checking account. Returning to work at Charmed by Dessert, the family bakery, is no longer merely her mother’s plan to push Bridget back into normal life; it has become a necessity for Bridget to pay the bills. As Bridget rediscovers the joy she once found in baking, she also rediscovers the warmth and closeness she once shared with her sisters. Nora, the rule-follower among the O’Bannon sisters, is the only one who has remained at the bakery. 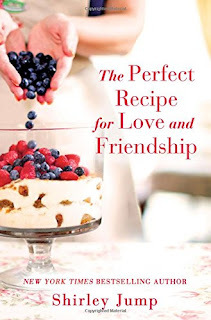 It is she with whom Bridget first restores the relationship, discovering a new appreciation for Nora’s gift as a cake decorator and an understanding that Nora’s life is less perfect than it has seemed. Margaret “Magpie” the youngest of the O’Bannons, is a freelance journalist who travels around the globe, moving in and out of her family’s lives between assignments. She has a knack for showing up or contacting Bridget with a phone call or a text to offer a bit of advice, pose a question, or give a verbal nudge just when Bridget most needs it. Abby, the sister to whom Bridget was closest growing up, is also the one from whom Bridget has been most deeply estranged. On Bridget’s wedding day, Abby warned that Jim was not the man Bridget thought he was, revealed a secret to Bridget and imposed a vow of silence on her, and had a shouting, cake-throwing argument with their mother that ruined the wedding reception. Bridget has hardly spoken to Abby since, but, realizing the hole Abby’s absence has left in her life, she takes the first step toward reconciliation. However, as Bridget’s relationship with her sisters grows warmer, her relationship with her mother grows more tense. Bridget finds it more and more difficult to tolerate her mother’s need to control her adult daughters and to understand her mother’s refusal to forgive Abby and welcome her back into the family. When her mother’s estranged sister shows up for a visit with Bridget, more family secrets are uncovered. Will love of family prove strong enough for these women to forgive and move beyond the revelations that threaten to tear them apart? Shirley Jump’s latest offering is a moving women’s fiction tale of the tenderness and turmoil that characterize sisterhood and the mother-daughter bond in one family. These characters are fully human with deep flaws and resilient strengths. Bridget is the central character, and she is highly relatable as she comes to terms with the gap between fairy tale dreams and the life women live. The gap she must face may be wider than the norm, but the experience is a common one. Jump’s portrayal of women’s relationships overall feels true, but I found the religious issue of particular interest since it is one that is rarely touched upon with such fairness and authenticity. Colleen O’Bannon, the mother of four daughters, is perhaps the most complex and the most interesting character. Widowed as a young woman with her children all under ten, she survives by holding her secrets close, maintaining a stoic façade, and demanding much of her daughters. A devout Catholic who has been sustained by her faith, she is angry and troubled when her daughters make choices that violate the teachings of the Church. Fans of Jump’s romance novels should be aware that this book is clearly women’s fiction. Although there is a budding romance for Bridget and even the suggestion of one for Colleen, the focus is on Bridget’s journey and on the relationships between sisters and mothers and daughters. If you like women’s fiction that offers an honest and sympathetic look at the lives of a group of ordinary women in one family, I think you will enjoy this one. I did. It is the first in a series. The second O’Bannon Sisters book, The Secret Ingredient for a Happy Marriage, will be released in the spring. Many women find out that life is neither simple nor easy. But, it is almost always interesting and educational if we are willing to learn. I think this book sounds like a really good read. Once again, your review has given me another book I think I really want to read....I am either going to have to unsubscribe (I would hate that) or learn to stop wanting every book I read about. This is a great book, about families, food and secrets!! I thoroughly enjoyed this one. Can't wait to read the next one! Another book that I need to read. Never having sisters but 4 brothers, I always enjoy reading these books. As the oldest of six (3 girls and 3 boys) siblings, I can relate to what you have said about the family dynamics in this book. It is usually much more complicated than most people think. I look forward to reading this book and will likely follow the series.